Is It Really Important to Floss? Your Dentist Eliminates the Confusion! More than likely, you’ve heard that it’s important to floss, but is this fact or just an opinion? Why is so much emphasis placed on this form of oral hygiene? Your local dentist says flossing is a vital practice to incorporate into your dental care routine. 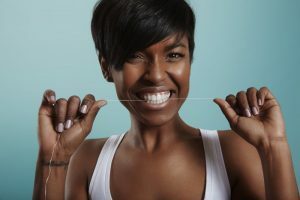 As you read on, you’ll learn how failing to floss on a consistent basis could leave you more susceptible to bacteria, plaque and tartar growth – all enemies of your oral health! When you eat or drink, if you don’t clean your teeth afterwards, debris and particles will be left behind to fester. Unaddressed, the bacteria cling to your teeth and along the gum line to consume the leftovers, releasing acids that can cause serious problems. Over time, hundreds of caustic bacteria can form a super-structure called plaque, which is a sticky, clear film that rests on teeth and gums. Over time, it can develop into hard, calcified deposits called tartar. Tooth decay – The acids released from bacteria, plaque and tartar can eventually wear down the protective outer layer of the teeth (called the enamel) and lead to tooth loss if untreated. Gum disease – Over time, plaque that rests at the gum line can work its way beneath to cause germ pockets to form. The result can be inflammation, which is called gingivitis – the first stage of gum disease. Most people will brush their teeth at least once a day, but studies show a toothbrush can only clean roughly 60% of the total surface of the teeth. That’s because it can’t maneuver into the tight spaces between them. As a general rule of thumb, you should brush and floss at least two times a day to see the best results. Extract roughly 18 inches of floss and wrap it around the third finger on each hand. Leaving one-to-two inches of floss exposed, carefully slide back-and-forth to descend between your teeth. Then, forming the floss into a “C” shape and using a back-and-forth motion, pull it out. After cleaning each tooth, to prevent any re-contamination, expose a new portion of the floss before continuing. Along with incorporating flossing into your daily oral hygiene routine, don’t forget to visit your local dentist for six-month check-ups. While there, you’ll receive a cleaning, examination and consultation, so you can leave healthier and better educated about your oral health! Dr. David W. Cleveland earned his dental degree from The Ohio State University College of Dentistry. While completing his one-year general practice residency, he received advanced training in a multitude of treatment areas, which allows him to provide comprehensive and competent care. Dr. Cleveland helps patients experience the joys of having excellent oral health at Darby Creek Dental, and he can be reached for more information through his website. Comments Off on Is It Really Important to Floss? Your Dentist Eliminates the Confusion!